This past Tuesday, Bryan and I visited Galvan Studios in Whittier with our Portrait Photography class. 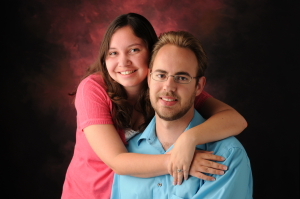 Galvan Studios is owned and operated by the husband and wife photography team of Yvette and Roman Galvan. It is located in Historical Uptown Whittier set among unique shops and boutiques. Yvette and Roman welcomed our 20+ student class very graciously. They began by showing us some of their work. Their work consists mostly of portrait and wedding photography. By viewing their photographs you can tell that they have a very unique style. They specialize in capturing real moments in their images. Upon discussing this in further detail, they revealed that they rarely pose their subjects but instead observe their subjects interacting and shoot when the moment is right. They also have mastered the art of composition and using available light. Because of this, their pictures are usually always perfect straight out of the camera and very rarely need tweaking in Photoshop afterwards. Following their work presentation, they answered a lot of the classes questions and showed us their equipment. They shoot with all Nikon equipment and have been for the majority of their career. The important thing they said that I thought I would mention is that the camera you own is not the most important thing when taking good photos. They said that you do not always have to have the most expensive, high end camera to take great pictures. The most important thing is knowing your camera inside and out and also understanding composition and knowing how to take advantage of the light that is available to you. 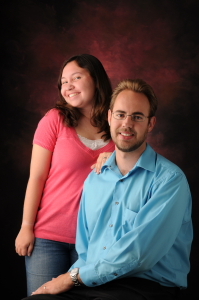 They also showed us how to set up a portrait shot of a couple with their studio equipment. Of course being the photogenic person that I am, I volunteered Bryan and I to be the couple. 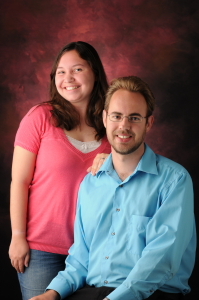 Now of course Bryan and I didn’t exactly dress to have our picture taken otherwise we would have worn more neutral colors, but I really thought the bright colors that we were wearing really made the photo pop. We’ve never had professional portrait photos taken in a studio so I wasn’t sure what to expect, but I think Yvette did a fantastic job. Not that I would have expected anything less of her, I mean look at their site, their photos are amazing! Listening to Yvette talk about how she and Roman run the business, especially about what has been successful and what has been not so successful has inspired me to try new things with Shez Photo. One thing I hope to do is to blog more about what’s going on with Bryan and I and our photography. This will coincide with our articles that we normally write with events, I hope to at least have a new entry every week even if we are not covering an event.